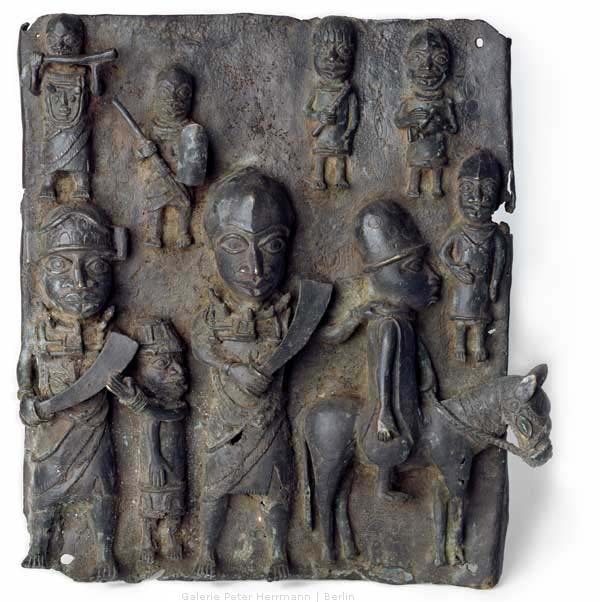 This bronze plaque depicts victorious Beninese warriors and their captives in an uncommon variety of shapes and forms and with uncommon detail. At the top left of the image, a hornblower musically accompanies the triumphal procession. The warrior in the middle drives a prisoner sitting on a small horse, holding him on a collar. The fact that the prisoner rides horseback indicates that he has a high rank, but his importance is qualified by the size ratios of the figures on the plaque; the central Beninese warrior is much larger, a clear emphasis of his position as victor. In addition, attributes like the leopard-teeth necklace and crocodile-skin helmet worn by that figure mark him as the highest ranking on the plaque. The warrior on the very left grasps the wrist of an even smaller prisoner and appears to be threatening him with his sabre. At the top of the plaque, several additional, small warriors belonging to the entourage are depicted. According to written records, such plaques decorated the wooden pillars of the palace. Kunst aus Benin. Afrikanische Meisterwerke aus der Sammlung Hans Meyer, Grassimuseum, Leipzig 2002, S. 98. Felix von LUSCHAN: Die Altertümer von Benin, Band 1, Berlin 1919, S. 255-257. W./ B. FORMAN, Philip DARK: Die Kunst von Benin, Prag 1960, S. 44. Barbara PLANKENSTEINER (Hg. ): Benin. Könige und Rituale. Höfische Kunst aus Nigeria, Wien 2007, S. 457. W./ B. FORMAN, Philip DARK: Die Kunst von Benin, Prag 1960, Tafel 42. Paula Girshick BEN-AMOS: The art of Benin, London 1995, S. 27. Augustus Henry PITT-RIVERS: Antique Works of Art from Benin, London 1900 (Reprint in New York 1976), S. 5. Kunst aus Benin. Afrikanische Meisterwerke aus der Sammlung Hans Meyer, Grassimuseum, Leipzig 2002, S. 99.